Yesterday, we discussed a single exercise that can help burn up to 19 calories per minute. Now take note that those numbers are just what you burn during the workout. The afterburn effect is even greater and that is why this exercise is so powerful. 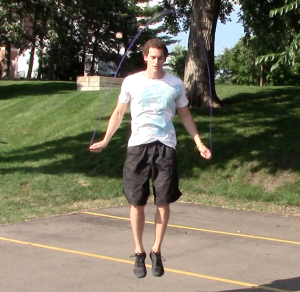 If you don’t know what I am talking about, I am referring to jump rope. Recently, my good friend Shawna released an incredible new Jump Rope Challenge workout program that I have been absolutely loving. In fact, I have enjoyed it so much that in every workout I have done in the past week I have included some kind of jumping rope. Today I would love to share with you one of the finishers I did that helped me burn an extra 100 calories in under 6 minutes! -Rest 30 seconds and Repeat 2 total times! Wow, talk about a challenging workout. If you think you are up to the challenge, give this a try for yourself. It takes only 5 minutes and 30 seconds so it is perfect as a finisher or an off day workout. If you want 10 more finishers just like this and an extra 21 full jump rope workouts, then you have got to check out Shawna’s new program! 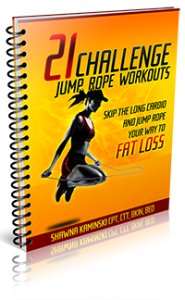 Sale==> 31 Jump Rope Challenge Workouts! Off to go do another jump rope workout!